The Manly 16s were greeted with the first decent nor-east seabreeze of the season for Pointscore Race 5 on Saturday – and with 26 starters and immaculate conditions, the 15 to 18-knot breeze caused some headaches in the rigging area where rig selection would prove crucial. Off the start line it was anyone’s game and the fleet was incredibly bunched as they hit the top mark for the first time after a short work upwind into Manly. Holmes Marine made the best of it to lead first time round, closely followed by Sutech, Fire Stopping, Fluid and Botany Access. A few boats bit the dust as they rounded with Namotu ending up in the drink and a few boats doing circles at the top mark. Down the first run, Sutech’s big rig was working overtime and they got through Holmes Marine with the pack very close as they hit the Balmoral turning mark for the first time. Sutech looked fast up the second work extending on the fleet with Holmes Marine’s little rig quick at the bottom end of the course in more pressure, but losing pace as the breeze softened back up towards Manly. Fire Stopping, Botany Access and Fluid (also on a small rig) were having a fantastic fight and all will be major players come the pointy end of the season. Sutech had an issue down the second run and dropped back to fifth with Fire Stopping taking the lead from Fluid, Botany Access and Holmes Marine who were still sniffing around. Fire Stopping extended up the third work and Holmes Marine were forced out by an issue halfway up the work. Sutech looked quick and were working hard to peg back Fluid and Botany Access. 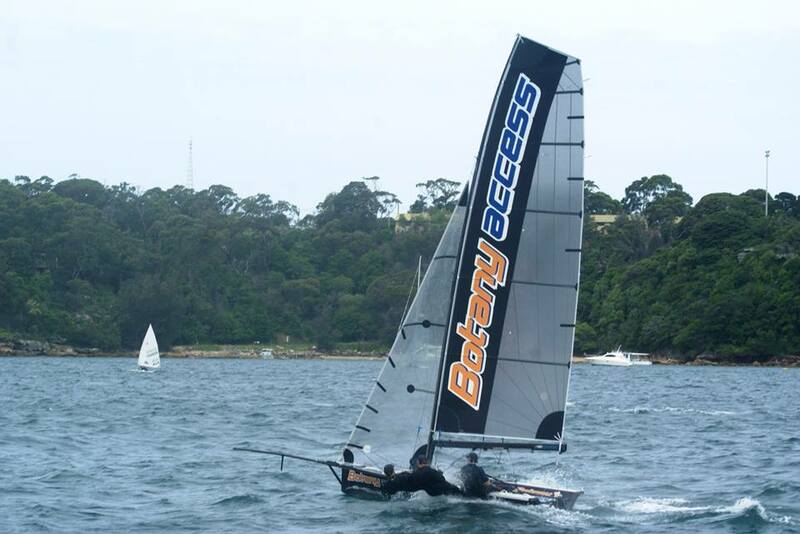 Typhoon and Brydens Lawyers were having a good battle at the front of the mid-fleet while Korman Marine, which has had a win already this season, was working its way through the fleet nicely. Fire Stopping held on for the win to make it two from as many weeks while Fluid did a mighty job in a fading breeze to hold on for second with the small rig. Sutech just managed to get through the Botany Access team on the way to the finish to cross the line third. Absolutely fantastic racing across the board and the fleet has an amazing amount of depth at the moment, which can be attributed to the fact the new Chinese production boats are allowing so many good second-hand hulls to filter through the fleet and fast track the development of the younger crews. There really is 10 boats that could have a win on their day!… Stay tuned for next week’s racing.